Ask around, we are the Grading Contractor of Choice. 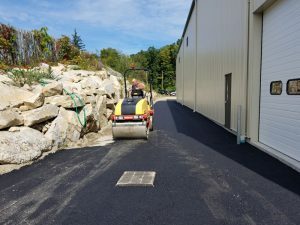 If you are planning on constructing an asphalt parking lot, driveway or any other paved surface, it is important to hire the right grading contractor to ensure a smooth surface that will not only be strong and durable, but dependable and aesthetically pleasing. We have the latest technology and equipment that will guarantee precise leveling while providing a sturdy sub-base at the beginning of pavement construction. A perfectly level surface matched with the appropriate drainage system will certify a proper water runoff and make sure that your driveway is not accompanied by puddles and unwanted water build up. By delivering well-executed grading, we eliminate the most difficult drainage problems and incidences that can lead to significant weakening and degradation of the pavement. Contact George Hartshorn Paving for water drainage and grading solutions for your driveway or parking lot installation!